Early detection and prevention of NCDs like Diabetes, Cardiovascular diseases, COAD, cancer, lipid diseases etc, have all fallen victim to a number of unnecessary hurdles and barriers. In this second article comparing the success of HIV intervention to luke-warm response to NCD prevention, we raise a number of contentious issues which the industry needs to consider and answer……. 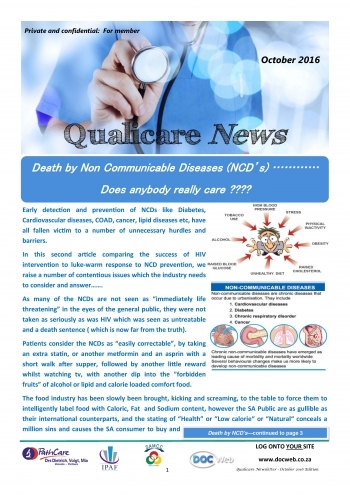 As many of the NCDs are not seen as “immediately life threatening” in the eyes of the general public, they were not taken as seriously as was HIV which was seen as untreatable and a death sentence (which is now far from the truth). Patients consider the NCDs as “easily correctable”, by taking an extra statin, or another metformin and an asprin with a short walk after supper, followed by another little reward whilst watching tv, with another dip into the ”forbidden fruits” of alcohol or lipid and calorie loaded comfort food. The food industry has been slowly been brought, kicking and screaming, to the table to force them to intelligently label food with Caloric, Fat and Sodium content, however the SA Public are as gullible as their international counterparts, and the stating of “Health” or “Low calorie“ or “Natural“ conceals a million sins and causes the SA consumer to buy and eat/drink with impunity. The vested interests in the food and beverage industry do not help us, what with chocolate flavored beers and fruit flavoured shooters and menthol flavoured cigarettes, combined with fast food industry supersized portions, stressful life styles and general lack of exercise. 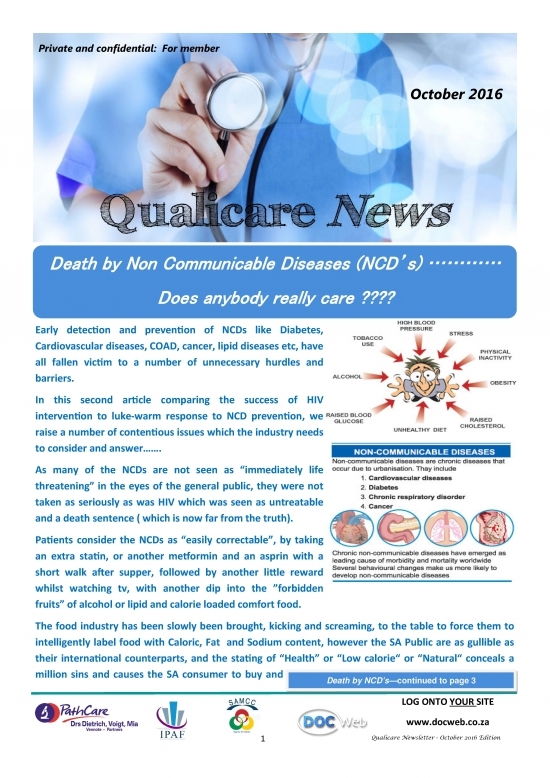 As these NCDs are however, for the most part asymptomatic, they lay silent for 8 to 10 years before revealing themselves, whilst assiduously doing their irreversible damage to circulatory systems and bodily functions. The key here is Family Practitioner education of our patients. Instead of “celebration” of our HIV status,positive or negative(!) we need to have GP orientated NCD pamphlets, waiting room videos and workshops, inserts into our accounts to patients, and, above all, we need to set the example to our patients of lifestyle modification. Funders need to run campaigns with family practitioners organisations to get the message out urgently!! Furthermore, direct referrals of these diseases to specialist practices, has also done the SA public, and their faith in General Practitioners, no favours. It seems that GPs can no longer handle Diabetes, Asthma, COAD etc, and that these resort in the domain of the specialists only! !There has been some meaningful progress recently and the IPAF and CDE are urgently approaching this to right this misperception. The key here is therefore early detection, education and prevention at FP level. The funders have slowly realised that treating these illnesses at secondary level, when things have gone wrong, is like putting paint onto wet walls, however a variety of funder and HPCSA obstacles remain in the way of the Family Practitioner in screening their patients. The use of a nurse practitioner for example, may not be charged for, and practitioners have to absorb the cost of the nursing practitioner into their practice running expenses, thereby making it uneconomical to employ one. The mundane reading of BP, blood sugar etc etc, is ludicrous to have to be done by the GP, as these could be successfully performed by an in house nurse/ sister who could also educate the patients in the waiting room. In Africa, the burden of Communicable Diseases has, understandably taken centre stage over NCDs, so this continent is on the backfoot already. Furthermore, some of the preventative measures like the cervical cancer vaccine, are not payable from the funder risk pools and are resented and resisted by the patient if they impact on their savings accounts. Worse of all however is the rivalry between schemes, and administrators to be “first to market” with turnkey NCD solutions, thereby hopefully attracting larger numbers of clients under administration. This has resulted in many organisations re- inventing the wheel repeatedly, and adopting varying non-uniform formularies, protocols, algorithms, patient advices, whilst sewing huge confusion and resentment amongst the medical profession at primary level. It is virtually impossible for the average practitioner to stay abreast of the plethora of changes in advisories, and protocols issued by the admnistrators, funders and clearing houses. This has resulted in a mood of surrender, by the PHC doctors, and a feeling that “I will treat my patients all equally, and efficiently, and if this is not in concert with the scheme, that is not my fault!”. This is embodied by an HPCSA advisory about preauthorisation by the HPCSA in which they clearly state that preauthorisation is not the practitioner’s role, or duty and that the patient needs to interact with the schemes on this level. What is needed is a centralised and integrated approach, starting with standardised communications, standardised and widely accepted tests paid from risk, rationalisation of primary care benefits, feedback loops to the GP and funders, coordination of care through the family practitioners, GP nomination, punitive co-payments for direct specialist referrals, and pay for performance enhancements at GP level with augmented consultation fees of multiple comorbidities. Without this, the only winners will be the administrators—or maybe that was the grand plan anyway?